On a beautifully cloudless day in the Western Cape this past December, I enjoyed the superb privilege of sitting underneath a vine bough, sipping an ice cold Pinotage Rosé while listening to a talk about permaculture (I’ll divulge more about that in a different post) before proceeding to learn how to make my very own, freshly prepared and customized pasta. We did this completely from scratch, using just our hands and a good old fashioned roller. 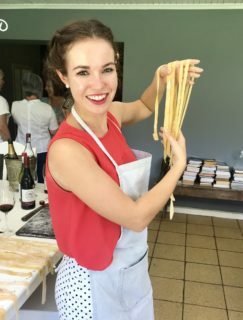 Believe it or not, this process is almost distressingly easy and fast – why did I grow up thinking you need factory-grade equipment and weeks to make pasta? 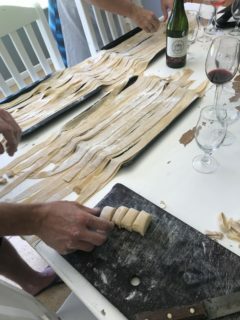 Now that I know how simple it is (not to mention how much better it tastes than store-bought pasta) fresh pasta will be featured more regularly in my kitchen! What’s more, you can prepare the sauce while you’re waiting for the dough to set, and the timing works out perfectly. 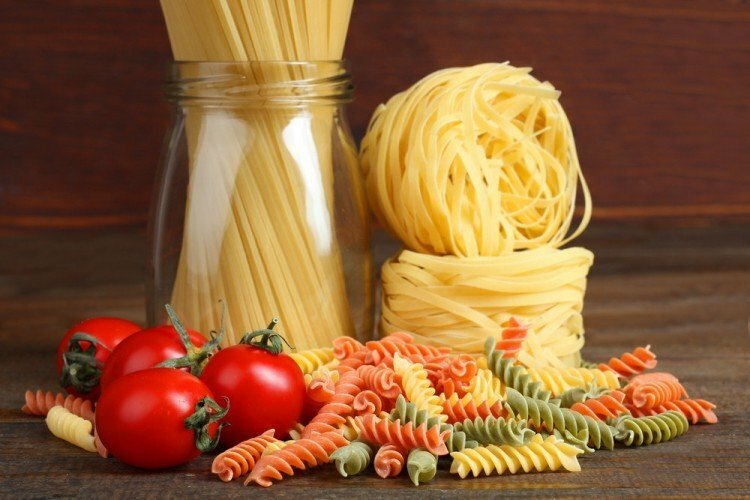 Best of all, you can ensure it’s a clean meal by buying organic ingredients, and enjoying your fresh pasta without any preservatives. 1. 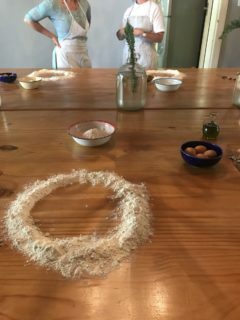 On a flat tabletop surface, arrange the flour in a circular shape, making sure there are no gaps. Crack the eggs into the circle and add the oil. Using a fork, whisk the eggs and oil together to form a wet mixture in the middle of the flour. Once the eggs and oil are well mixed, start to gradually whisk the wet mixture with the flour to form a dough. Take care to ensure that there are no lumps. 2. When the dough gets too firm to continue whisking with a fork, place the dough onto a clean work surface, scattering any leftover flour from the tabletop. You will now start to knead the dough until it is silky smooth, Italian-mother-style. The technique here is important, as you want to get all the last clumps out for good. 3. Arrange your hands on top of each other and place them on the dough, with your dominant hand at the bottom. Pressing down on the dough ball with your body weight, roll it out in a repeated motion. Continue for approximately 15 minutes, until the surface consistency of the dough is smooth, stiff and silky. 4. Loosely wrap the dough ball in the olive-oil coated baking paper and allow it to rest in room temperature for approximately 20 minutes while you prepare the pasta sauce of your choice. If you’re making pasta in advance, the ball can also remain in the fridge for up to a day. 5. Unwrap the dough ball and cut it into four sections. You are now going to roll out the dough very thinly, so while you are rolling out one section, keep the others covered with the plastic film to prevent them drying out. 6. Dusting the dough section lightly with flour, shape it into a square and place on a flat surface. Using the rolling pin, flatten it out as thin as it will go without tearing. 7. Give the flattened dough another dusting with flour before rolling it up, starting from the end closest to you. You want a good flat, wide roll roll to cut into strips. 8. Use a sharp knife to cut the roll into strips about the width of your finger, until they are the length and width of tagliatelle pasta. Loosen the strips and lay them flat on a work surface before delivering the final flour dusting. 9. In a medium-sized pot, boil water and add the strips one by one. Once everything has been added, boil the pasta for about 2 minutes (because it’s fresh, you don’t need a lot of time for it to cook), then drain in a colander. 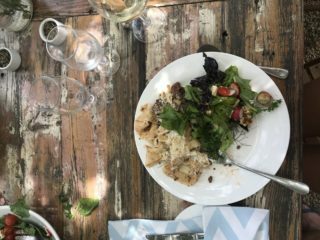 Serve with your pasta sauce and fresh basil or rosemary leaves and Parmesan, along with a big bowl of fresh salad. Click on the link for a good pasta sauce that pairs well with this recipe.